Some open water swimmers are afraid of sharks, orcas and jellyfish. "But one thing that always surprises me is running into a plastic bag while swimming in the ocean," says Steven Munatones. "You are just swimming along, looking at the distant shoreline or trying to navigate the elements, and then...wham...your hand is enveloped into a plastic shopping bag or big wad of gross mess. My heart always seems to miss a beat when that happens. I immediately raised my head and momentarily skip a breath until I see it is just one more bit of trash in the ocean." Doug Woodring of Ocean Recovery Alliance and Open Water Asia has created one modern technology - a Global Alert app - that can report and monitor trash hotspots by anyone, anywhere in the world. Identification of the location of the trash locations is one starting point for trying to find solutions. "We are excited that our Global Alert was chosen as the best project in Hong Kong and will be honored with the National Energy Globe Award Hong Kong," explains the environmentalist who was selected as the guest of honor of the 2017 Bosphorus Cross-Continental Swim (Samsung Boğaziçi Kıtalararası Yüzme Yarışı). "Energy Globe presents these committed people and organizations and their actions on June 5th, the World Environment Day, to tell the world that there are many creative people out there with great projects providing answers to many of our environmental problems. This year, over 2,000 submissions from over 170 countries were reviewed. One of Energy Globe’s beacon projects is the Energy Globe Award. This environmental prize with project submissions from 178 countries has become a significant signpost to the future. By awarding these projects and presenting them to the global public, it raises attention to already existing good solutions for many of our problems." For more information, visit www.energyglobe.info. Woodring and his Ocean Recovery Alliance colleagues will be in New York City at the World Ocean Festival that will start off the United Nations Ocean Conference week on June 4th on Governor's Island. He explains, "There will be an Ocean Village, a celebration of art, education, innovation and tools for action in support of the ocean on Governor's Island. 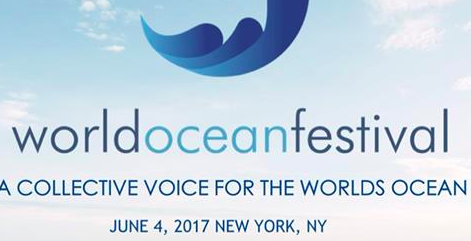 The Ocean March is a parade of large and small boats on the water as a statement of unity for the ocean in the New York Harbor and across the world." For more information, visit Facebook, Instagram, and Twitter.